Comfort. Faith. Joy. Devotion. 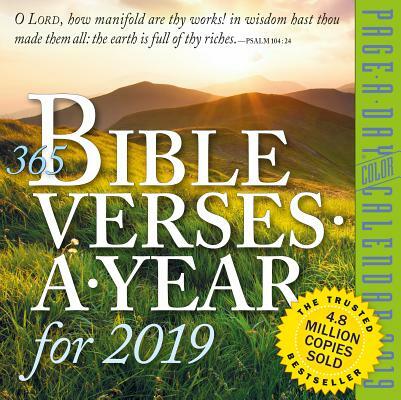 365 BIBLE VERSES-A-YEAR CALENDAR is the perennially bestselling Bible calendar. Here is scripture, cited chapter and verse from the King James version, accompanied by exquisite, full-color nature photographs that celebrate the beauty of our world—like elegantly entangled vines, illustrating our interconnectedness with God, or a glowing sun over a snowbank at dawn, reminding us of the Lord’s gift of light. It’s a daily dose of the wisdom and peace of His Word. Every image and verse is an affirmation and an inspiration.